ELKHART, Ind. - Ever-committed to offering innovative products that meet customers' needs, while minimizing environmental impact, Dometic hits the market with a lineup of lightweight products for 2009. From awnings to toilets, Dometic has designed a variety of products meant to keep vehicle weight low and provide RVers with top-of-the-line function. The Cabana Lightweight RV Dome AwningTM increases living space by as much as 881 cu. ft. 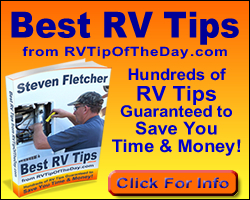 The self-contained awning stows on the side of the camper and comes in four widths (7 ft., 9 ft., 11 ft., 12 ft.), all with an 8-ft. projection. The durable water-pressure proof fabric dome offers cool, dry shade. The awning features roll-up mesh sides, a removable front panel and a roll-up side door for quick and easy privacy or entry/exit. The 310 toilet features best-in-class gravity flush. The power flush technology offers the only true, 100 percent swirling bowl coverage for complete cleaning action. Available in standard and low profile models, the lightweight 310 toilet features a longer, full-size seat and ideal bowl height to ensure comfort. 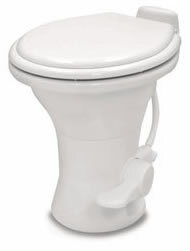 The flushing technology includes a drop-away ball and valve with a new seal-tight system. The waterline quick-connect function and one-piece base with two-bolt connection provide easy installation, servicing and cleaning. The lightweight, Euro-style cooktops unite form and function with their sleek design, stainless steel standard and powerful, efficient operation. Integrated glass covers create more workspace, while electric ignition provides easy use. Each cooktop features flame failure safety and sealed combustion. The two-burner and two-burner hybrid models boil water 18 percent faster than the industry standard. The two-burner comes equipped with 5,200 and 6,800 BTU burners, while the hybrid has 7,400 and 9,600 BTU burners. 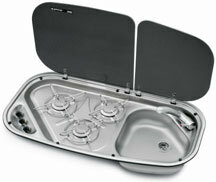 The three-burner cooktop with sink option has two 5,200 burners and one 6,800 BTU burner. Dometic is a leading international supplier of specialty products and systems for increased comfort away from home. Dometic provides recreation vehicle, pleasure boat and special refrigeration systems for use mainly in the leisure industry, the hotel sector and in medical markets. Dometic has achieved leading global market positions by focusing on its strong customer relationships and developing innovative solutions. Dometic has production facilities in 10 countries, its own sales and marketing operations in 17 countries plus approximately 65 distributors globally. For more information, contact Dometic at 574-294-2511 or visit www.Dometic.com.